The switching mixer is usually of passive type and therefore without DC voltage (if not for the Bias) and consequently gives an insertion loss. What I am about to describe is of the same type, but provides a (positive) conversion gain and therefore has a novel configuration. "The switch", for commutating, can be inserted between the antenna filter and the first intermediate frequency transformer. It can be connected in series, to interrupt the RF, or in parallel for shorting it to ground (see Fig. 1 and Fig. 2). In the circuit here described it is placed as shown in fig. 3, in series to the “cold” side of the intermediate frequency transformer. A JFET (see fig. 4) is used which is considered one of the best RF switches. In reality, the FET functions as a variable resistor. The RF signal is sent, via the capacitor C1, to the primary of the first IF transformer that is an integral part of the mixer. This signal is in series with the L/C primary that does not oppose any resistance or impedance (but opposes it to the frequency of the IF), then transits undisturbed and appears at pin 2 which is connected to the drain of the FET whose acting as a switch opening and closing at the rhythm of the local oscillator frequency. The resulting IF signal that we find in pin 1 of the transformer, which being in parallel, is filtered by the same transformer. The extraordinary thing is that, with this configuration, the signal undergoes an “amplification"! This is due to the mixing mechanism that in the primary of the transformer produces a sort of magnification of the IF signal at resonance, so we have a passive mixer with voltage gain! Simple, is not it? The amplification that we can obtain ranges from a minimum of 3dB to more than 10dB (!). It is linked to the Q of the tuned circuit of the IF transformer. By also using the secondary we get more selectivity but less gain due to the insertion loss of the filter. This can be remedied by coupling the primary to the secondary with a capacitor. While not a balanced circuit, the rejection of the local oscillator in the RF and IF ports is quite good and is mainly due to the inner workings of the FET. In Table A are shown the results obtained from a prototype built with a JFET N-channel type BF246A and a 467 kHz IF transformer (Geloso type 671). Note the good value of the 1 dB compression point. The circuit diagram is shown in Figure 5. 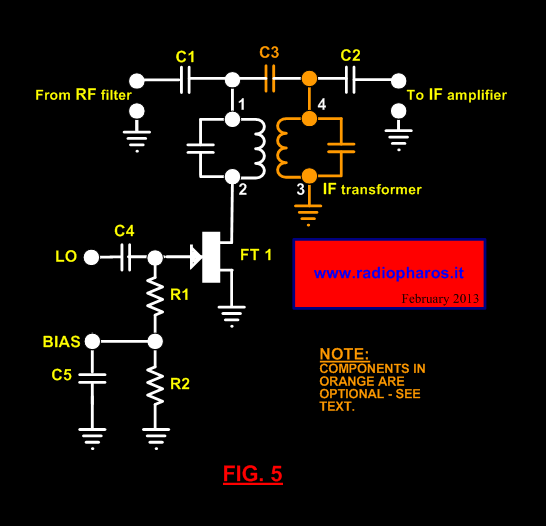 The RF filter can produce a further "amplification" due to the turns ratio of the antenna transformer, this gain is however limited by the low value of the C1 capacitor which serves, also, to "isolate" the RF tuned circuit from that of the IF transformer. The latter must be readjusted on the value of the original frequency because the capacity of the RF circuit tends to move it to a lower one. 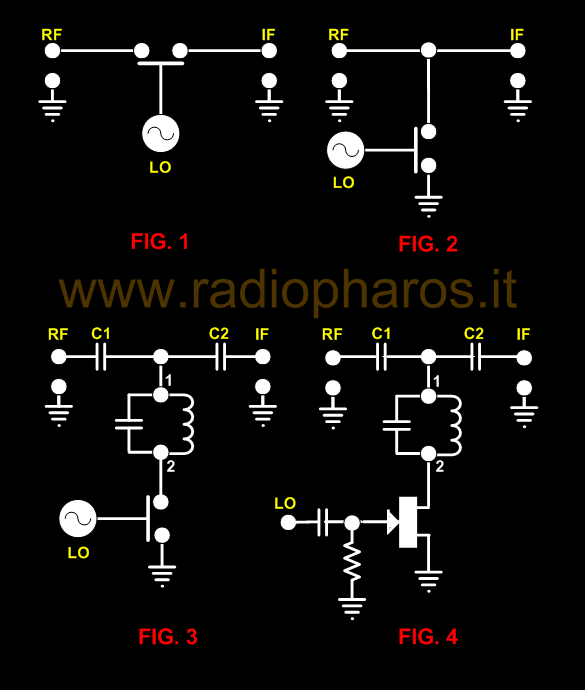 Nothing prevents us to interpose an RF amplifier stage or a buffer (source follower). Also the value of rejection of the local oscillator in antenna is improved thanks to the filtering and the step-down of the antenna circuit. The BIAS voltage is required to operate the JFET as a switch. This mixer, like most of the switching mixers, has a tendency to mix with harmonics of the local oscillator; accordingly a good RF filter is strictly necessary. It will be apparent to those skilled in the art of RF mixers design that the "switch" can also be of another kind, even a tube! I forgot to say that SEM is an acronym of the Latin "Simplex Est Melius" which translates into English as "Simple is better"!